In the world of adventure tourism, you’re likely to meet a number of colorful characters–guides who have traveled the world, worked on every continent, have multiple qualifications under their belts (er, harnesses), and can tell a great joke. Most likely, they’re males. The badass female guide is a rare but awesome encounter as women gain more footing in the adventure world, and for many lady travelers, having a female guide for their adventures is a welcome change. Adventurous women understand other adventurous women in a way that the average male guide, however awesome they are, just can’t. At Deep Canyon in Wanaka, in the South Island of New Zealand, guides Renee van Praag and Rita Schöberl are the perfect example of women who not only rock at their jobs, guiding clients through Wanaka’s world-class canyons, but they allow a great opportunity for ladies to hook in with a female guide if they’ve been contemplating an excursion and would feel more comfortable being led by a woman. These women aren’t just holding their own in adventure tourism, they’re leading the way in a unique and growing sport. The word on how awesome canyoning is has spread, and as more travelers get a taste for the adventure– a descent into the hidden world of waterfalls and crystal blue pools, amazing rock formations, and a journey of jumping, abseiling, and sliding. Rita and Renee are at the forefront as part of the team at Deep Canyon, New Zealand’s longest running canyon company, founded in 1994. And guess what? The company is co-owned and was co-founded by a woman, Ros Goulding, whose early exploration of the canyons directly influenced the tours offered today. Originally hailing from Austria, Rita has led commercial canyon trips for over five years in Austria, Italy, and Germany. Her spunky personality keeps guests engaged and laughing, while her years of experience, study, and playing in the outdoors have developed her keen sense for safety. A senior guide, Rita leads groups through some of the most challenging canyons of New Zealand, including Deep Canyon’s Leaping Burn Max trip. This is an advanced experience with technical abseils, big jumps, and huge rewards, including a descent along an 80 meter waterfall. 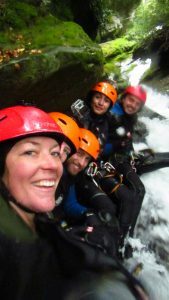 Renee began canyoning in the Blue Mountains of her home country Australia, and has led hundreds of trips with a broad range of guests, taking it up a notch with the bigger, wetter canyons of New Zealand. Both Rita and Renee are as comfortable leading groups of confident adrenaline junkies as they are guiding the cautious first-timers, ensuring everyone walks away with a feeling of achievement and sense of wonder after one of the most incredible travel experiences they’re likely to have. 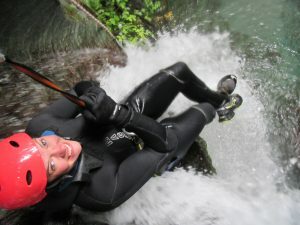 Anna Crafar guided for 3 years for Deep Canyon and is currently living and guiding in Waitomo. Diana Harl guided for Deep Canyon for the last few years and now lives in Germany. Ros Goulding is the company’s co-owner/co-founder. For women traveling solo or in a group, the thirst for adventure can sometimes be squelched by negative experiences or feeling intimidated. 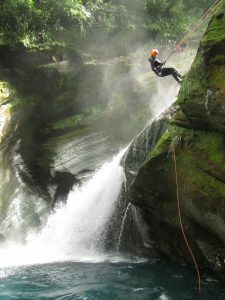 Canyoning offers an amazing, unique adventure for all levels, an unforgettable journey through places one might never get to see without an experienced guide. 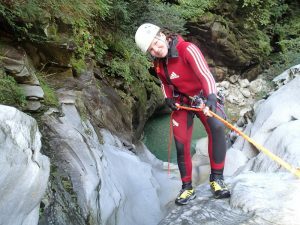 With the opportunity to be matched with an awesome female guide, canyoning just might be the perfect answer to satisfy that adventure craving.